Southeast Michigan (includes Detroit) Christmas Tree Farms: choose-and-cut Christmas trees, Tree lots with pre-cut trees, stands, sleigh rides, hay rides and related winter events and fun! 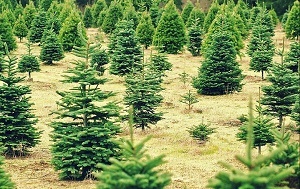 Whether you want to cut your own tree, pick a live tree and have it cut for you, buy a tree already cut or buy a living tree you can plant, this page provides detailed listings of Southeast Michigan (includes Detroit) 's choose-and-cut Christmas tree farms, places to buy pre-cut (also called pre-harvested and fresh-cut) trees, stands, sleigh rides, hay rides and related winter events and fun. Some listings are for tree farms, others are tree lots, and some only offer hay rides, sleigh rides or other winter events. READ EACH LISTING to know what each facility offers. The farms are listed further down this page, so scroll down the page! Since this service is free and open to ALL Christmas tree farms, not just those who belong to an association or pay for an ad, like almost all other websites do, this is the most complete and current listing available! I'm always looking for more to add, and to correct any inaccuracies or errors, so if you encounter any, please email me ! And please tell the farmer you visit in Southeast Michigan (includes Detroit) that you found their farm here! I need the farmers to realize that you found them here so that they will keep their information up to date! 3500 Milnes Road, Hillsdale, MI 49242. Phone: 517-437-4495. Alternate phone: 517-437 7483. Click here for our Facebook page. TThe weekends between Thanksgiving and Christmas are some of the busiest times here at Glei's. We have several precut trees to choose from in all shapes and sizes. Or you can go out into the field and cut your own - we even have loner saws. If you want something a little different, try having a tree flocked - colors vary by year, but white, black, red, blue, and green are favorites. Poinsettias: It simply wouldn't be the holidays without the vast display of poinsettias in every color imaginable filling the greenhouse. We provide several churches with their holiday orders, and for the last couple years, our poinsettias can be seen in the background on the Channel 10 news. You-Choose and You-Cut varieties: Scotch Pine, Blue Spruce, Firs, Douglas Fir. Spruce Acres - Christmas trees-you choose and you cut, baling, Precut trees Christmas trees, Tall (9ft+) trees. 3620 N. Lake Wilson Road, Hillsdale, 49242. Phone: (517) 849-9612. Open: from the Saturday after Thanksgiving; Weekdays 2 pm to 5 pm; Weekends 9 am to 5 pm. You-Choose and You-Cut varieties: Blue Spruce, White Spruce, Norway Spruce, Concolor Fir, Fraser Fir. Austin Tree Farm - Christmas trees-you choose and you cut, Shaking, baling, tree stands, tree bags, Tall (9ft+) trees, wagon/sleigh rides, food & drinks, you may reserve a tree in advance, Christmas gift shop. 2840 North Okemos Road, Okemos, MI 48864. Phone: (517) 351-7851. Email: draustin@aol.com. Open: weekdays 3 pm to 5:30 pm, weekends 10 am to 5:30 pm. Click here for a link to our Facebook page . You-Choose and You-Cut varieties: Blue Spruce, Canaan Fir. 1002 Kinneville Road, Leslie, MI 49251. Phone: 517-589-8521. Email: dltrees@yahoo.com. Open: 7 days; Monday to Thursday, from 12 pm to dusk; Friday, Saturday and Sunday, from 10 am to dusk; Opening the day after Thanksgiving; Call after December 21st to make sure we are still open; Closed for the season at noon December 24th. Click here for current open hours, days and dates. Directions: US 127 between Jackson and Lansing, use exit 56. Signs posted. Click here for a map and directions. Payment: Cash, Check. Click here for our Facebook page . We offer FREE HORSE DRAWN WAGON RIDES (Draft Mules-weather permitting). The two weekends for Christmas 2017 are Saturday & Sunday November 25th & 26th - December 2nd & 3rd. The wagon rides are from 10 am to 5 pm or you may choose to walk through our mowed fields with a tree cart that we provide to easily carry your tree back to our barn. You can listen to our Christmas music while standing near our weekend warming fire or browse through our decorated Christmas barn while we get your Christmas Tree ready for transporting home. Look on Facebook for any change as we approach Christmas to find out if we are sold out of some types of trees or if we closed early for the season. Sorry but we cannot sell next year's trees. You-Choose and You-Cut varieties: Balsam Fir, Colorado Blue Spruce, Douglas Fir, Fraser Fir, Scotch Pine, White Pine. PreCut varieties: Balsam Fir, Colorado Blue Spruce, Douglas Fir, Fraser Fir, Scotch Pine, White Pine. 1808 Hagadorn, Mason, MI 48854. Phone: 517 676-4824. Email: Discounttrees@aol.com. Open: Directions: Located at the SE corner of Clark Rd and Chandler Rd in Bath MI, we offer a variety of Christmas trees in all shapes and sizes. We also offer potted trees and beautiful hand made wreathes, made fresh with clippings from our trees! Come out to choose from our pre-cut trees or cut your own tree and enjoy our FREE tractor rides! Click here for a link to our Facebook page. You-Choose and You-Cut varieties: Scotch Pine, Blue Spruce, White Spruce, White Pine, Douglas Fir, Norway Spruce, Concolor Fir, Fraser Fir. Tannenbaum Farms - Christmas trees-you choose and you cut, Michigan "Snowfresh" trees, shaking, baling, tree stands, tree bags, Precut trees Christmas trees, wreaths and garlands, Tall (9ft+) trees, living trees (in containers), wagon/sleigh rides, food & drinks, petting zoo, Christmas gift shop. 2515 Sandhill Road, Mason, MI 48854. Phone: (517) 332-2094. Open: day after Thanksgiving to Christmas, weekdays 12:30-6, weekends 9 am to 6 pm. You-Choose and You-Cut varieties: Scotch Pine, Blue Spruce, White Pine, Douglas Fir, Concolor Fir, Fraser Fir, Balsam Fir, Canaan Fir. Gwinn's Tree Farm - Christmas trees-you choose and you cut, Shaking, baling, tree stands, tree bags, Precut trees Christmas trees, wreaths and garlands, Tall (9ft+) trees, wagon/sleigh rides, food & drinks, Christmas gift shop. 4226 Farwell Lake Road, Horton, MI 49246. Phone: (517) 688-3230. Open: from the day after Thanksgiving,.12 pm to dark on Monday to Friday, Saturday and Sunday from 10 amto dark. We are a family owned Choose and Cut Christmas Tree Farm. We offer free wagon rides and tree boughs, Santa on weekends. You-Choose and You-Cut varieties: Scotch Pine, Blue Spruce, White Spruce, White Pine, Douglas Fir, Austrian Pine, Fraser Fir. 7118 Pentecost Hwy, Tipton, MI 49287. Phone: 517-431-2258. Directions: Three miles south of M-50. From Adrian, follow Wolf Creek Hwy north until it turns into Pentecost Hwy. Continue 2 miles to the farm. Open: Monday to Friday, noon until dark, Saturday and Sunday, 8 am to dark. ; for Christmas Trees from the Friday after Thanksgiving until Christmas Eve. Payment: Cash, Check. You-Choose and You-Cut varieties: Blue Spruce, Eastern White Pine, Norway Spruce, Scotch Pine, White Spruce. Carousel Acres, inc. - No Christmas trees, instead: Santa appearances, sleigh rides, snacks and refreshment stand, restrooms, picnic area, face painting, pony rides, petting zoo, farm animals, birthday parties, school tours, events at your location (call for info) (NOTE: No trees for sale). 12749 9 mile road, South Lyon, MI 48178. Phone: 248-437-7669. Email: tammyiac@al.com. And for a map to our farm, click here. Open: Check our web site or call 248-437-7669 for season hour's. Carousel Acres offers animal presentations at our farm or at your location. The middle of November thru December visit Santa and our reindeer, yes they really do exist. Santa will be visiting Carousel Acres from 10:00 a.m. to 7:00 p.m on December 1 & December 8, 2013. Reserve your special private visit with Santa and his live Reindeer with a photographer from Divine Reflections Photography. Each appointment will be 15 minutes long, you will get up to 10 edited high quality photos mailed to you on a disk with reprint rights. The 2013 cost for this private memorable session is $75. Payment: Cash, Check. Carousel Acres specializes in Mobile Petting Farm/Petting Zoo, Pony Rides/Pony Parties that are wonderful for Birthdays, School and Community Events, Family Reunions, Company Picnics and more. Carousel Acres is available all year for your special events. Have your party here or let us bring the farm to you. If you are on our schedule you can be sure that we will be at your event. Carousel Acres has been in business since 1993 and over the years we have built a loyal client base due to our reliability and follow through to make your day as special and stress free as possible. Our animals are clean, well cared for, very social as many of them were bottle raised here on the farm. Carousel Acres will not for any reason cancel your pony party, petting farm or any event...guaranteed. We have had the privilege of watching children experience the best party year after year because our reputation speaks for itself. Waldock Tree Farm - Christmas trees-you choose and you cut, Shaking, baling, tree stands, tree bags, wreaths and garlands, Tall (9ft+) trees, living trees (in containers), food & drinks, Christmas gift shop. 3090 Dutcher Road, Howell, MI 48843. Phone: (517) 546-3890. Open: UPDATE: December 10, 2018: Sold out of trees; They are closed until next season (2019), when their hours should be: Thanksgiving weekend and the next 3 weekends only on Saturday and Sunday from 9 am to dark (about 5 pm); If you need to come out during the week or have any questions, please give us a call. Saws are provided if you need one and we will also cut your tree for you if you like. Sorry no chain saws. Our wagon will pick your tree up and we will shake, wrap and drill the bottom of your tree for the pin type stands for free. In our warm barn we have a donut machine, where we make fresh donuts all day long. We make 3 types of donuts and have hot cocoa, cider (cold and hot), tea, coffee, pop and water. In our gift shop we carry many ornaments, collectables and one of a kind, unique items from Kenya & Tanzania that we bring back every year while on safari. We have a good supply of trees from 6-10 feet with some to 13ft. We grow the following fir tree; Canaan, Concolor, Fraser and Korean. Also a few Blue Spruce. As always we shake, wrap and drill your tree for the pin type stands for free. We do sell the pin type stands. We also provide saws. In our warm barn we make our own donuts and we also sell hot cocoa, coffee, tea, water and pop. We also have a gift shop with some items from East Africa. Our location is Southwest of Howell. 3090 Dutcher rd. You-Choose and You-Cut varieties: Blue Spruce, White Pine, Douglas Fir, Norway Spruce, Concolor Fir, Fraser Fir, Balsam Fir, Black Hills Spruce, Canaan Fir. 8000 Chamberlin Road Dexter, Michigan 48130, Dexter, MI 48130. Phone: 734-426-2476. Open: Mon-Thurs: 3:30pm to dark Friday to Sunday from 9 am to dark. Directions: See their website for directions. Payment: Cash, Check . Westman's Tree Farm is a U-Cut Christmas tree farm, located 5 miles north of Dexter, just minutes from Pinckney, Whitmore Lake, Hamburg, Chelsea, Brighton & Ann Arbor. Westman's has thousands of trees to choose from. We have a large number of trees that range from 5 - 8 feet in size, and a limited number from 9 - 10 feet. With proper care and water, they will hold their needles for up 6 weeks! We have saws, twine, bailer & shaker and we can assist with cutting and loading of your tree. No large trees available on our farm! Comments from a visitor on December 01, 2012: "Love this U-cut tree farm. 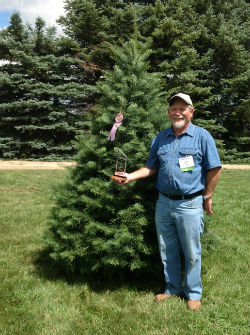 Bill has beautiful spruce trees. He will trailer your tree back to the parking lot where they shake and bale them and help you put it on your car. Also, have door wreaths for sale. Very reasonable prices and high quality trees." Blake Orchard & Cider Mill - Train ride tours, u-cut Christmas trees, shaking, baling, tree stands, tree bags, Precut trees Christmas trees, wreaths and garlands, Tall (9ft+) trees, living trees (in containers), wagon/sleigh rides, food & drinks, Christmas gift shop. 17985 Center Road, Armada, MI 48005. Phone: 586-784-5343, Open: 8 am until 5:30pm, 7-days a week until December 23rd; The last wagon will go out at 5 pm daily; Santa will be here starting November 25 to 27, 2016, December 3-4, Dec 10-11 and December 17-18. Blake's Orchard & Cider Mill will be closing at 4 pm on December 23rd for the season. Blake's Hard Cider & Winery tasting room will be open all winter! January Hours: Thursday-Saturday 11 am to 11 pm, Sunday 11 am to 6 pm. Starting the weekend before Thanksgiving at Blake's Cider Mill location we begin our Christmas tree season offering a large variety of pre-cut and u-cut Christmas trees! We provide: Saws to cut your trees., Free wagon rides to the Christmas tree fields; Free tree cleaning and wrapping. We also have fresh wreaths, cedar roping, grave blankets and other unique Christmas decorations available.Blake's Hard Cider & Winery tasting room is open daily. Sunday- Wednesday 11 am to 6 pm, THursday-Saturday 11 am to 11 pm. The Orchard Cafe will be ope on Saturdays & Sundays starting the weekend after Thanksgiving through December offering you delicious Italian Sausage, Hot Dogs and other food to satisfy your hunger! You-Choose and You-Cut varieties: Scotch Pine, Blue Spruce, White Spruce, White Pine, Douglas Fir, Austrian Pine, Norway Spruce, Concolor Fir, Fraser Fir, Balsam Fir, Canaan Fir. Opper Land Pines - Shaking, baling, tree stands, tree bags, Tall (9ft+) trees, wagon/sleigh rides, food & drinks, Christmas gift shop. 59500 Frost Road, New Haven, MI 48048. Phone: (586) 749-9888. Email: xavier@speednetllc.com. Open: 10 am to 5 pm weekends after Thanksgiving..
You-Choose and You-Cut varieties: Scotch Pine, Blue Spruce, White Spruce. 12502 Ida West Road, Petersburg, MI 49270. Phone: 734-868-0411. Alternate Phone: 734-693-1371. Email: bigbucktree@charter.net. Open: UPDATE for 2018, Does anyone have current information, are they still in business and open? If so, please write me, last reported hours were November 25 till December 24 daily from 9 am till dark. Directions: Located 3 and 1/4 miles east of US23 at Exit 13 or 1 1/4 west of Ida, Michigan. Click here for a map and directions. Payment: Cash, only. You-Choose and You-Cut varieties: Austrian Pine, Blue Spruce, Colorado Blue Spruce, Douglas Fir, Fraser Fir, Norway Spruce, White Fir (Concolor Fir), White Pine, White Spruce. You Choose and We cut varieties: Austrian Pine, Colorado Blue Spruce, White Fir (Concolor Fir), Douglas Fir, Fraser Fir, Norway Spruce, White Fir (Concolor Fir), White Pine, White Spruce. Living, rooted tree varieties: Blue Spruce, Colorado Blue Spruce, Norway Spruce. Monroeville Road, Franklinville, NJ 08322. Phone: 856-468-5949. Email: bob@exleyslandscaping.com. Open: Weekends only: Friday through Sunday, from 9 am to 4:30pm. Directions: Click here for a map and directions. Family Activities are Saturday and Sunday, 10 am to 3 pm. Payment: Cash, Debit cards, Visa/MasterCard, AmEx. Family activities on Saturday and Sunday include free hayride and visits with Santa. Friday through Sunday activities include free kids games, train display, fire pit area and visits with Christmas Donkeys Jack and Jill! Holiday Greens for sale include wreaths, roping, grave blankets and custom made greenery. 3030 Samaria road (M-151), Temperance, MI 48182. Phone: 734-856-4000. Email us at: d2trab@aol.com. Open: UPDATE for 2018, Does anyone have current information, are they still in business and open? If so, please write me, last reported hours were dawn to dusk daily Open for Christmas trees from Thanksgiving until Christmas eve Directions: From the North: South on Secor Road to Samaria Rd (M-151) East, about 1/2 mile. Farm is on the North side of the road. >From the South: North on Secor Road past Ohio / Michigan border to Samaria Rd (M-151). East on Samaria Rd (M-151) about 1/2 mile. Farm is on the North side of the road. >From the East: West on Samaria Rd (M-151) between Douglas Road and Secor Road. Farm is on the north side of the road. >From the West: East on Samaria Rd (M-151) about 1/2 mile east of Secor Road. Farm is on the north side of the road. And for a map to our farm, click here. Our products are usually available in November, December. Payment: Cash, Check. You-Choose and You-Cut varieties: Austrian Pine, Blue Spruce, Colorado Blue Spruce, Concolor Fir (White Fir), Douglas Fir, Fraser Fir, Norway Spruce, Scotch Pine, White Fir (Concolor Fir), White Pine. Matthes Evergreen Farm - Christmas trees-you choose and you cut, Precut trees Christmas trees, Shaking, baling, tree stands, tree bags, wreaths and garlands, living trees (in containers), wagon/sleigh rides, food & drinks, Santa visits (call for dates and times), you may reserve a tree in advance, petting zoo, Christmas gift shop. 13416 Lulu Road, Ida, MI 48140. Phone: (734) 269-2668. Email: wilpegmatthes@msn.com. Open: 9-4 daily. Select Your Christmas Tree from either one of our Pre-cut trees or Cut Your Own trees in one of our fields. Choose from Scotch Pine, Blue Spruce, Canaan Fir, Fraser Fir and more. Pre-cut Christmas Trees including Fraser Fir 6 ft to 12 ft. Bring your own saw or use and return one of ours. Get your saw at the little red barn. Take a free tractor-pulled wagon ride from the field to the shaker and baler (available on the weekends). Have your tree shaken for free and/or baled for a $3.00. You-Choose and You-Cut varieties: Scotch Pine, Blue Spruce, White Pine, Douglas Fir, Austrian Pine, Norway Spruce, Concolor Fir, Fraser Fir, Canaan Fir. Comments from a visitor on August 15, 2009: "Been going there for more than 20 years it is great. They have restrooms, and a kitchen area with food and drinks, they have hayrides, petting zoo, crafts show each weekend. Entertainment each weekend. " 7258 Jackman Road, Ida, MI 48140. Phone: 734-269-6421. Alternate Phone: 734-735-1379. Email: justinryan_8@msn.com. Open: Friday November 26 from 9 Am until dark; Normal Operation Hours: Monday to Friday from 3:30 to dark Saturday and Sunday from 9 am to dark. Directions: If coming from Toledo, head north on Jackman Road for eight miles north of the Michigan state line. The farm will be located on the west side of Jackman Road between Todd and Morroco. If coming from the Monroe area, head south on Telegraph Road to Yagerville Road West on Yagerville for approximately eight miles to Jackman Road. Head south on Jackman Road for 1.5 miles and the farm will be located on the west side of the road. Click here for a map and directions. Payment: Cash, Check. You-Choose and You-Cut varieties: Black Hills Spruce, Canaan Fir, Colorado Blue Spruce, Douglas Fir, Eastern White Pine, Fraser Fir, Scotch Pine, White Pine. You Choose and We cut varieties: Black Hills Spruce, Canaan Fir, Colorado Blue Spruce, Douglas Fir, Eastern White Pine, Fraser Fir, Scotch Pine, White Pine. Living, rooted tree varieties: Austrian Pine, Colorado Blue Spruce, Eastern White Pine, Norway Spruce. 4527 West Newburg, Carleton, MI 48117. Phone: 734-636-3484. Alternate Phone: 734-869-5023. Email: cujie69@yahoo.com. Open: Weekdays by appointment only Weekends from 8 am to 6 pm. Directions: Click here for a map and directions. Payment: Cash, Check. You-Choose and You-Cut varieties: Balsam Fir, Blue Spruce, Canaan Fir, Douglas Fir, Eastern White Pine, Fraser Fir, Norway Spruce, Scotch Pine, White Fir (Concolor Fir). You Choose and We cut varieties: Balsam Fir, Blue Spruce, Canaan Fir, White Fir (Concolor Fir), Douglas Fir, Eastern White Pine, Fraser Fir, White Fir (Concolor Fir). You-Choose and You-Cut varieties: Austrian Pine, Balsam Fir, Black Hills Spruce, Colorado Blue Spruce, White Fir (Concolor Fir), Douglas Fir, Fraser Fir, Norway Spruce, White Pine. You Choose and We cut varieties: Austrian Pine, Balsam Fir, Black Hills Spruce, Colorado Blue Spruce, White Fir (Concolor Fir), Douglas Fir, Fraser Fir, Norway Spruce, White Pine. Broadview Christmas Tree Farm - Shaking, baling, tree stands, Precut trees Christmas trees, wreaths and garlands, Tall (9ft+) trees, wagon rides, food & drinks. 4380 N. Hickory Ridge Road, Highland, MI 48357. Phone: (248) 887-TREE. Open: UPDATE: December 10, 2018: They are closed until next season (2019), when their hours should be: 9 am to 5 pm daily. You-Choose and You-Cut varieties: Scotch Pine, Blue Spruce, White Spruce, Douglas Fir, Concolor Fir, Fraser Fir. Candy Cane Christmas Tree Farm - Christmas trees, Fresh wreaths and roping. Hot drinks in the barn. Exotic animals. Live trees available for planting Spring and Fall, Michigan "Snowfresh" trees, shaking, baling, tree stands, tree bags, Precut trees Christmas trees, wreaths and garlands, Tall (9ft+) trees, living trees (in containers), food & drinks, you may reserve a tree in advance, petting zoo. 4780 Seymour Lake Road, Oxford, MI 48371. Phone: (248) 628-8899. Email: genovesec@scglobal.net. Open: Saturday & Sunday (including Friday after Thanksgiving) 9 am to 5 pm; Monday through Friday 10 am to 5 pm; Santa will visit with us on the first few weekends (in 2016, these dates: Nov. 25, 26 & 27, Dec. 3 & 4, and Dec. 10 & 11).Directions: 4780 Seymour Lake Road. From I-75 take Exit 89 (Sashabaw Road)and go N 4- 1/2 miles Turn right (E) on Seymour Lake Road and go 3/4 mile Farm is on the right. From Oxford (M-24) turn W on Burdick and go 3 miles Left on Baldwin for 1/3 mile Right on Seymour Lake. Click here for a link to our Facebook page . arm features include the free use of saws and tree carts, free tree cleaning, wrapping, drilling and candy canes. Visit Santa on the weekends! Well-behaved dogs on leashes are welcome (please come prepared to clean up after your dog!). Cash, checks, debit, VISA, MC and DISC are all accepted forms of payment.Check out our coupon page! Get your Merry Christmas Coupon here. NOTE: There seems to be something wrong with their website this year; Click here for a link to our Facebook page instead. You-Choose and You-Cut varieties: Scotch Pine, Blue Spruce, White Spruce, White Pine, Austrian Pine, Concolor Fir, Fraser Fir, Balsam Fir, Black Hills Spruce, Canaan Fir. 1520 Dorn Drive, Leonard, MI 48367. Phone: 248-431-0043. Email: colombomt@treelawn.com. Open: The 3 days after Thanksgiving and the next 3 weekends in December. Directions: Payment: Cash, only. Ortonville, MI. Phone: 248-627-3329. Open all year for milk and ice cream, Monday-Saturday, 9 am to 8 pm, Sunday 12 pm to 8 pm. U-pick pumpkins in October Pre-cut Christmas trees in December Open 361 days a year. 4235 Middle Road, Highland, MI 48357. Phone: 248-891-2135. Alternate Phone: 248-887-1494. Fax: 810-632-5759. Email: MrGsTrees@comcast.net. Open: Seven days a week, 10 am to 5 pm, Christmas Trees from the Saturday before Thanksgiving through Christmas Eve. Directions: We are located on the border of Livingston and Oakland Counties, north of M-59 between Hickory Ridge Road and Tipsico Lake Road. Click here for a map and directions. We follow organic practices, but are not seeking certification. Payment: Cash, Check. On the Farm for you to choose and cut, we have many varieties of trees at various heights. Although we are not certified as Organic, we do follow organic growing practices. And we still have the best trees at the best price. You-Choose and You-Cut varieties: Balsam Fir, Blue Spruce, Colorado Blue Spruce, Douglas Fir, Fraser Fir, White Fir (Concolor Fir). PreCut varieties: Balsam Fir, Blue Spruce, Colorado Blue Spruce, White Fir (Concolor Fir), Douglas Fir, White Fir (Concolor Fir). 7355 Fish Lake Road, Holly, MI 48442. Phone: (248) 634-8102. Email: stf@hollychristmastreefarm.com. Open: Please visit our web site for hours for Santa, directions, etc. on select days from 10 AM to 5 PM during the season (please see Days & Hours of Operation ) Stanczyk Tree Farm offers over 10 acres of "choose-&-cut" and fresh pre-cut Christmas trees from the following varieties: Canaan Fir, Concolor Fir, Korean Fir, and Fraser Fir. Tree drilling, shaking, and wrapping are also provided to help make the holiday experience of getting your very own REAL Christmas tree a memorable one! 4357 E. Baldwin Road, Holly, MI 48442. Phone: 810-694-9958. Email: info@trimpines.com. Open: starting Saturday after Thanksgiving through, December 13th from noon till 4:30pm on Saturday and Sunday; Christmas Hayrides on Saturdays from 10 am to dusk and Sundays from 12 pm to dusk. Please visit our web site for hours for Santa, refreshments, and custom wreath decorating. Directions: Off I-75 between exits 106 and 108. Click here for a map and directions. Click here for current open hours, days and dates. Payment: Cash, Check, Visa/MasterCard, Discover. Genesee County 2-Cylinder Club Antique tractor display with buzz-saw demonstrations - date to be announced. You-Choose and You-Cut varieties: Blue Spruce, Canaan Fir, Colorado Blue Spruce, White Fir (Concolor Fir), Douglas Fir, Fraser Fir, Grand Fir, Noble Fir, Norway Spruce, White Fir (Concolor Fir), White Spruce, and other varieties (call!). PreCut varieties: Balsam Fir, White Fir (Concolor Fir), Douglas Fir, Eastern White Pine, Fraser Fir, White Pine. Arend Tree Farms #1 - Christmas trees-you choose and you cut, Precut Christmas trees, Christmas wreaths, Shaking, baling, tree stands, tree bags, garlands, Tall (9ft+) trees, living trees (in containers), wagon/sleigh rides, food & drinks. 3512 Notten Road, Grass Lake, MI 49240. Phone: 734 475-7584. Open: daily, from 9 am to 5 pm starting the day after Thanksgiving. Horse-drawn wagon rides on the weekends weather permitting. These Belgium draft horses are a treat most children and adults have never seen. Another attraction is the 150 year-old country church that is adjacent to the farm. Many families make it part of their holiday tradition to stop by the church for homemade donuts and cider or to purchase unique Christmas craft items. We also provide pre-cut trees priced as low as five dollars for the budget minded. These smaller trees used to be call "Charlie Brown trees" and we would give them away, but through the years, our quality has improved so we really don't have anymore trees that qualify as "Charlie Browns". Our main objective is to provide a friendly and memorable experience for your whole family. We look forward to seeing you. Click here for a link to our Facebook page . You-Choose and You-Cut varieties: Blue Spruce, White Pine, Douglas Fir, Fraser Fir, Balsam Fir, Canaan Fir. Arend Tree Farms #2 - Christmas trees-you choose and you cut, Precut Christmas trees, Christmas wreaths, Shaking, baling, tree stands, tree bags, garlands, Tall (9ft+) trees, living trees (in containers), food & drinks. 12870 S. M-50, Brooklyn, MI 48930. Phone: (517) 592-2006. Open: daily, from 9 am to 5 pm starting the day after Thanksgiving. Click here for a link to our Facebook page . 796 Warren Road, Ann Arbor, MI 48105. Phone: 734-663-2717. Email: braunstrees@yahoo.com. And for a map to our farm, click here. Open: Friday to Sunday 10 am until dark Payment: Cash, Check. Precut varieties: Douglas Fir, Fraser Fir, Canaan Fir, Balsam Fir & Concolor Fir from 7 ft. to 10 ft. tall. C & G Tree Farm - Christmas trees-you choose and you cut, Precut Christmas trees, Shaking, baling, tree stands, tree bags, Tall (9ft+) trees, you may reserve a tree in advance. 4304 Renas Road, Gladwin, MI 48624. Phone: 989-426-7825. Email: gjgrinn@ejourney.com. Open: 9 am to 5 pm, opens November 26. 796 Warren Road, Ann Arbor, MI 48105. Phone: 734 663-2717. Fax: 734 994 1593. Open: Friday, Satuday and Sunday from 10 am to dark. We supply all you need to identify the right species, cut your favorite tree and haul it back to the shop on our wheeled carts. Once there, we will shake it (to remove loose needles) and bale it with plastic twine for easy transport to your home. We encourage you to take your time while hunting for your favorite tree. Please feel free to wander our 50 acres of trees, but please be careful as the land is uneven and there are a few stumps buried under the snow. Bring the whole family - great Christmas photo opportunity - and we are very dog-friendly! Christmas tree varieties: Scotch Pine, Blue Spruce, White Spruce, White Pine, Douglas Fir, Fraser Fir, Balsam Fir. 14745 Sharon Hollow Rd., Manchester, MI 48158. Phone: (517) 456-7233. Email: hillsidefarm@hillsidechristmastreefarm.com. Open: UPDATE: December 10, 2018: They are closed until next season (2019), when their hours should be: See our website for this years dates and hours. Click here for current open hours, days and dates. Directions: Located just off of US-12 in the Irish Hills area four miles west of m-52. Generally centered west of Ann Arbor, east of Jackson, south of Chelsea and north of Adrian. Click here for a map and directions. Payment: Cash, Check. Click here for our Facebook page. A Christmas barn nicely decorated in the season and gets your family into the holiday spirit. A day at Hillside starts by entering our spacious parking lot, grabbing a saw and accessing the fields for your perfect tree by taking a wagon ride, walking or driving (weather and field conditions permitting). Upon your return, your tree is shaken (cleaned) free of charge, then if desired wrapped for a nominal fee, lastly the tree is measured for pricing. The kids can play in the hay stack play area or choose their own small Christmas tree from our Tot Lot pre-cut tree lot. Your family can conclude your experience at Hillside Christmas Tree Farm by visiting the Christmas Barn and enjoying hot chocolate, hot cider, and cookies by the fireplace and �get into the spirit' by joining in the Christmas Carol Sing Along / Karaoke. Mother can check out the many hand made Christmas crafts and decorations available for purchase while the kids enjoy watching the Christmas display. You-Choose and You-Cut varieties: Balsam Fir, Black Hills Spruce, Blue Spruce, Canaan Fir, Colorado Blue Spruce, Douglas Fir, Scotch Pine, White Fir (Concolor Fir). You Choose and We cut varieties: Balsam Fir, Black Hills Spruce, Blue Spruce, Canaan Fir, Colorado Blue Spruce, White Fir (Concolor Fir), Douglas Fir, Scotch Pine, White Fir (Concolor Fir). PreCut varieties: Balsam Fir, Black Hills Spruce, Blue Spruce, Canaan Fir, Colorado Blue Spruce, White Fir (Concolor Fir), Douglas Fir, Scotch Pine, White Fir (Concolor Fir). Sun Tree Farms - Shaking, baling, tree bags, Precut trees Christmas trees, wreaths and garlands, Tall (9ft+) trees. You-Choose and You-Cut varieties: Scotch Pine, Blue Spruce, Fraser Fir, Balsam Fir. 7897 6 Mile Road, Northville, MI 48167. Phone: 248-437-8200. Fax: 248-437-8252. Email: threecedarsfarm@charter.net. Open: Friday and Saturday 10 am to 8 pm; Sunday 10 am to 5 pm. ; Santa's Hours in 2018 are Friday 4 pm to 8 pm; Saturday 11 am to 2 pm and 4 pm to 7 pm; Sunday 12 pm to 4 pm. Directions: for a map to our farm, Click here. Christmas trees, wreaths, Country Store and pictures with Santa and Mrs.Claus. Friday after Thanksgiving to December 23. Closed Christmas Eve. Payment: Cash, Check. 10050 Jerusalem Rd, Dexter, MI 48130. Phone: (734) 433-8733. Email: info@urquharttreefarms.com. Open: four weekends, Starting the Friday after Thanksgiving; Friday November 23, Saturday November 24 and Sunday November 25 in 2018 from 10 am to 5 pm; Business Hours: Wednesdays and Thursdays: 3:00 pm to 5 pm, Fridays: 12 pm to 5 pm, Saturdays and Sundays: 10 am to 5:00 pm* Last Full - Service Day: Saturday, December 15: Last day with full - service provided; Self - Service Days Sunday, December 16 to Sunday, December 23: Self - service continues through December 23, during our regular business hours (see above); Saws and carts are available; Not all fields are open; No services are provided (baling, shaking, refreshment stand); Note: Closed for the Season on Sunday, December 23 at 5 pm;* *Choosing and cutting a tree generally takes an hour, so please arrive at least an hour prior to closing; We suggest that you arrive even sooner to ensure that you have time to visit our most remote fields, to take a tractor ride, and still have a hot cocoa when you finish up; Thank you for your understanding and we appreciate your business. Open: Click here for current open hours, days and dates. Directions: Holiday Farm Directions (10,000 Jerusalem Road ): Take I-94 to Exit 167, Baker Road (Dexter exit) Go South 1/4 mile to Jackson Road Turn right and travel West 1 mile to Parker Road Turn left and travel South 3/4 miles to Jerusalem Road Turn right and travel West 1-1/2 miles to the Farm entrance on the right Look for the green fence. Click here for a map and directions. Payment: Cash, Check, Debit cards, Visa/MasterCard, Discover, AmEx. Click here for our Facebook page. U-Choose and Cut varieties: Blue Spruce, Canaan Fir, Douglas Fir, Fraser Fir, White Fir (Concolor Fir), White Pine, White Spruce. PreCut varieties: Blue Spruce, Douglas Fir, Fraser Fir. You-Choose and You-Cut varieties: Blue Spruce, Colorado Blue Spruce, Norway Spruce, White Spruce. 7839 Curtis Road, Northville, MI 48168. Phone: 248-437-7219. Email: info@willowgreenhouse.com. Open: See our website for current hours. Click here for current open hours, days and dates. Directions: Click here for a map and directions. Payment: Cash, Check, Debit cards, Visa/MasterCard, Discover, AmEx. Click here for our Facebook page. Come have some fun this holiday season! We will be having workshops every Saturday and Sunday starting November 26th! Click the button below to see all the dates and to register. Fresh Cut, Michigan Grown ​Christmas Trees. Bring the kids and stroll through our Christmas tree lot. Pick from hundreds of fresh cut, Michigan grown Christmas trees. ​Once you find that perfect tree we will give it a fresh cut, net it and load it onto your car while you enjoy some hot chocolate by our toasty fire! PreCut varieties: Fraser Fir, White Fir (Concolor Fir). 16 South Washington Street, Ypsilanti, MI 48197. Phone: (734) 707-7442. Email: ypsiplanti@growinghope.net. Open: Holiday Trees & Greens Weekend on December 1, 2017 from 4 pm to 7 pm. YpsiPlanti Garden Supply by Growing Hope is hosting a Winter Trees & Greens fundraising sale by Zilke Vegetable Farm of Milan. Stop by to get your locally grown, freshly cut Fraser Fir Trees, Roping, Wreaths. Outdoor Pot Decor, Centerpieces. A portion of the proceeds will be donated to Growing Hope. Click here for a link to our Facebook page. Huron Christmas Farm - Christmas trees-you choose and you cut, Precut Christmas trees, Christmas wreaths, baling, tree stands, tree bags, garlands, Tall (9ft+) trees, living trees (in containers), Santa visits (call for dates and times). 32120 King Road, New Boston, MI 48164. Phone: (734) 753-9288. Email: lsdavis@centurytel.net. Open: 9 am to dark. Click here for a map. Come join the fun at Downriver's closest Choose & Cut tree farm, just 5 miles south of Detroit Metro Airport. Open every day from 9 am until dark. Payment: Due to the fact that we have no electricity, the only payment types that we can accept is cash or check. Click here for a link to our Facebook page. We furnish saws, and have Tree Life Vitamin Treatment, and disposal bags for sale as well as Net Bailing, and Beautiful Fresh Wreaths. Come on out to the Huron Christmas Tree Farm.. and let Our Family help Your Family make this the most special Christmas yet. You-Choose and You-Cut varieties: Scotch Pine, Blue Spruce, White Spruce, White Pine, Douglas Fir, Fraser Fir, Balsam Fir. PreCut varieties: Balsam Fir, Fraser Fir, Scotch Pine, White Pine, and other varieties (call! ).